In 1925 Winchester necked down the .30-03 to .277 and created the .270 Win., a sporting cartridge designed for medium-size game that shot flatter yet recoiled less than the .30-06 Springfield. Originally chambered in the Model 54, the .270 Win. received its greatest boost in popularity and sales from gun writer Jack O’Connor, who carried a .270 around the globe. You would think the popularity of the .270 would’ve spawned a ton of competing cartridges that fired .277-inch bullets. But for decades only one other commercial .270 hunting cartridge was released: the .270 Wby. Mag. Seventy-six years after the .270 broke cover Winchester launched the .300 WSM, and a year later in 2002 Winchester unveiled the .270 WSM. In the WSM .270 fans found a short, powerful, efficient round that could be housed in compact, lightweight short-action rifles and which edged closer to 7mm Rem. Mag. ballistics. Plus, the .270 WSM could poach from an already extensive lineup of .277 bullets designed for the .270 Win. 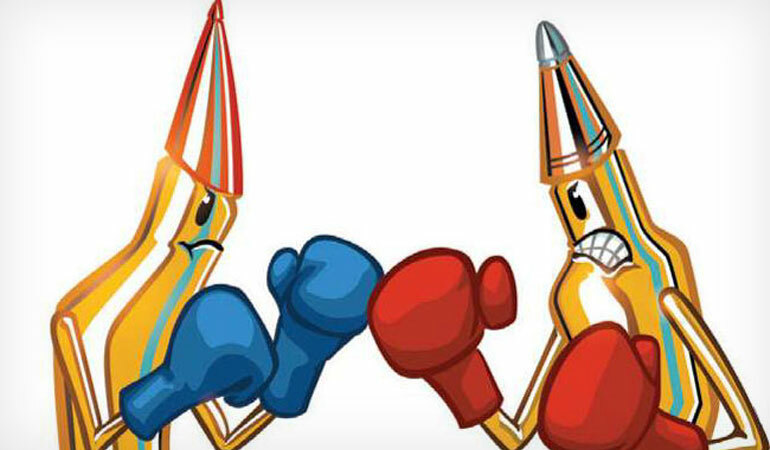 Since both cartridges draw from the same pool of 130- to 150-grain hunting bullets, it’s of little value to compare projectile availability between these two rounds. The .270 WSM, as I mentioned, does generate better ballistics than the old .270. The difference is not, however, extraordinarily dramatic. With bullets of 130 to 140 grains, the .270 WSM will buy you between 150 and 200 additional feet per second of velocity. With heavy (150 grain) bullets the difference is about 100 fps, hardly enough to place the WSM in a different league than the original .270 Win. When comparing two loads with identical bullets (Hornady’s 145-grain Precision Hunter ELD-X), the .270 WSM is 130 fps faster than the .270 Win. with muzzle velocities of 3,100 and 2,970 fps, respectively. With this load, the .270 WSM generates roughly 250 additional foot-pounds of energy over its competitor at the muzzle when both cartridges are fired from 24-inch barrels. At 500 yards the .270 Win. lags behind the short mag by about 100 fps and the WSM carries about 150 ft.-lbs. more energy at that range. In terms of trajectory, the newer cartridge has an edge, but it’s relatively minor. With a 200-yard zero, the older .270 Win. drops about 3.5 inches more than the short mag at 500 yards. But at 400 yards the difference is less than two inches. So the WSM has an edge, albeit a slight one. If you’re using the two cartridges at ranges less than a quarter-mile, the trajectory difference is negligible, but the .270 WSM does have the advantage of utilizing a shorter action than the .270 Win. However, the .270 Win.’s long case body feeds easily in most rifles while the WSM has a reputation for being more finicky. Rifles and ammo are widely available for both guns, but with an almost 80-year head start you’ll encounter more .270 Win. rifles than WSMs on used gun racks. Likewise, ammunition for the .270 WSM is less likely to be found on every store shelf, but it’s relatively widely available, and many sporting goods stores—even relatively small stores—often stock .270 WSM. There are a number of relatively inexpensive factory loads for the .270 Win. with advertised prices as low as a dollar a round for quality ammunition. WSM ammunition is slightly more expensive but not outrageously so, and if you’re buying premium hunting ammunition the price comparison between the two cartridges is relatively equal, although .270 Win. loads are typically a few cents cheaper per shot. The .270 Win. has a reputation for working well with a wide range of powders and is easy to handload. The .270 WSM is also capable of excellent accuracy but prefers slow-burning powders.